Max Biaggi's plans for a strong winter of testing in preparation for the 2005 MotoGP season have been dealt a cruel blow after he broke his ankle in a Supermoto accident. Initial reports suggest the Italian will be out of action for two months. 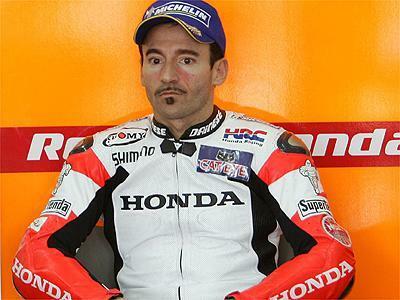 Biaggi, who for 2005 is Honda's leading rider after landing a deal to ride alongside Nicky Hayden in the Repsol team only this week, was testing at a supermoto track near his home when he fell awkwardly and sustained multiple ankle fractures. He will undergo an operation to fix the broken ankle tonight in Lyon, France – a renowned specialist doing the op. If there is a silver lining for Biaggi, it's that there is a winter testing ban which comes into force in December and January, which means he shouldn't lose too much test time compared to his rivals.